The United States does not seek to topple the North Korean government and would like dialogue with Pyongyang at some point, but only on the understanding that it can never be a nuclear power, Secretary of State Rex Tillerson said on Tuesday. Speaking to reporters at the State Department days after Pyongyang tested its second intercontinental ballistic missile (ICBM), Tillerson reiterated that Washington sought to persuade North Korea to give up its missile and nuclear weapons programs through peaceful pressure. "We do not seek a regime change, we do not seek a collapse of the regime, we do not seek an accelerated reunification of the peninsula, we do not seek an excuse to send our military north of the 38th Parallel," Tillerson said. "We are not your enemy ... but you are presenting an unacceptable threat to us, and we have to respond. And we hope that at some point they will begin to understand that and we would like to sit and have a dialogue with them." However, "a condition of those talks is there is no future where North Korea holds nuclear weapons or the ability to deliver those nuclear weapons to anyone in the region, much less the (U.S.) homeland," he said. North Korea has vowed to develop a nuclear-tipped missile capable of hitting the United States and U.S. officials said the latest test had shown it may now be able to reach most of the country. Tillerson repeated calls for North Korea's neighbor and ally China, which has urged a resumption of talks with Pyongyang, to use its influence to create the conditions for "productive dialogue." He said other options were "not particularly attractive." President Donald Trump's administration has said all options are on the table in dealing with North Korea, including military ones. However, given the potential for massive casualties from North Korean retaliation in allied South Korea and Japan and among U.S. troops there, it has stressed the need for a diplomatic solution. Earlier on Tuesday, a leading Republican senator, Lindsey Graham, said Trump had told him he was willing to go to war with North Korea "if they continued to try to hit America with an ICBM." "He's told me that. I believe him. If I were China, I would believe him, too, and do something about it. You can stop North Korea, militarily or diplomatically," he said on NBC's "Today Show." 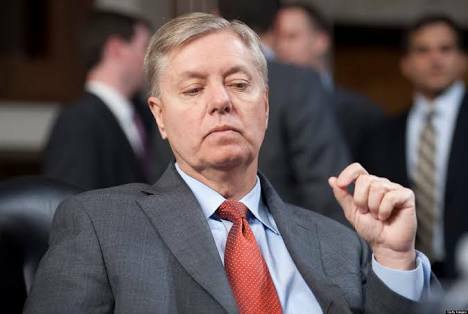 "There is a military option: To destroy North Korea's program and North Korea itself," Graham said. "I prefer the diplomatic approach. But they will not be allowed to have a missile to hit America with a nuclear weapon on top." Asked about Graham's remarks, White House spokeswoman Sarah Sanders reiterated that the administration was "keeping all options on the table."